1. Bill on Ratification by the Republic of Burundi of Grant Agreement No. 2000001940 between the Republic of Burundi and the International Fund for Agricultural Development for the financing of the Agricultural and Rural Financial Inclusion Project of Burundi (PAIFAR-B), presented by the Minister of Agriculture and Livestock. The Government of Burundi has received USD 24.9 million in grant funding from the International Fund for Agricultural Development (IFAD) for Burundi’s Agricultural and Rural Financial Inclusion Project. This project will be implemented in six provinces covered by projects and programs financed by the ongoing International Fund for Agricultural Development. These are Bubanza, Cibitoke, Gitega, Karusi, Kayanza and Muramvya Provinces and will last seven years. The project will make it easier for agricultural and non-agricultural producers and young people to access loans and develop income-generating activities. More than 99,200 households will benefit from the support of this project. The bill was endorsed. 2. Bill on the ratification by the Republic of Burundi of the Minamata Convention on Mercury, presented by the Minister of Water, Environment and Urban Planning. Mercury is a highly toxic heavy metal that poses a threat to human health and the global environment. It is particularly harmful to the nervous system, thyroid, lungs, immune system, eyes, gums and skin. Among the main sources of mercury emissions in the environment is artisanal gold panning using mercury to amalgamate gold particles. Mercury is also used in many products such as batteries, measuring devices, some health products, etc. Aware of the harmful impacts of this substance, the International Community decided in February 2009 to establish a legally binding instrument which is this Convention adopted in 2010 by 140 States, whose overall objective is to protect human health and the environment against mercury emissions and releases. By ratifying this Convention, Burundi will have undertaken to take appropriate measures to phase out mercury-containing products, develop and implement a national action plan to eliminate the use of mercury in artisanal mining and small-scale gold and raise public awareness about the negative effects of mercury use. After analysis, the Council considered it useful to analyze first the implications of this ratification and also to be sufficiently informed about the countries which have already ratified this Convention. A team has been designated for this purpose and the bill will be brought back within one month. 3. Bill on the Revision of the Burundi Environment Code, presented by the Minister of Water, Environment and Urban Planning. The current Environment Code dates back to 2000 and was promulgated as the country began to put in place the first elements of a national environmental protection policy. Today, it is necessary to update it in order to adapt it to the new requirements of the environment as they emerge from the major International Conventions in this area and the guidelines of recently developed environmental policies and strategies. Thus, after seventeen years of implementation, this Code has shown some shortcomings in addressing emerging environmental issues such as the prevention and management of natural disasters, the issue of climate change, invasive species, and so on. This revision of the Environmental Code is therefore proposed in order to comply with the new challenges in the field of the environment. After much exchange and enrichment of the project, the project was adopted and a team was designated for its finalization. 4. Bill on Special Provisions for Petroleum Trade and Petroleum Products, presented by the Minister of Energy and Mining. Oil stands into the Burundian economy as an unavoidable and almost irreplaceable product. Beyond its omnipresence in all sectors of the economy, the oil issue can constitute a source of internal and international tension and a source of pollution of the environment. Various texts regulating this sector were put in place but they lacked certain coherence because they intervened to solve a punctual problem especially in case of major disruption of the supplies of the country, and the proposed Bill comes to address this situation. The Bill applies to the import, refining, export, storage, transportation and distribution of oil and petroleum products within the territory of Burundi. Among the major innovations that this law brings is the creation of a regulatory body for the sector, the introduction of strategic stock regulation, and so on. Following discussions on this bill, the Council adopted it with some amendments. 7. 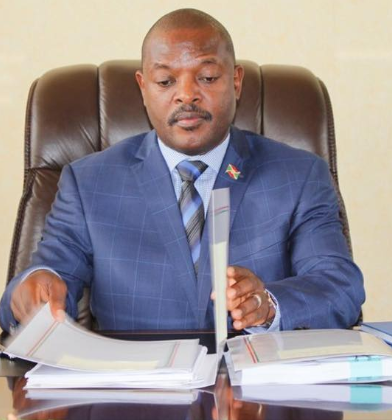 Draft Decree granting a research permit for Iron-Titanium-Vanadium and associated minerals on the Mukanda area in favor of CVMR Energy Metals Burundi SURL ; all three presented by the Minister of Energy and Mining. Chemical Vapor Metal Refining Corporation (CVMR) headquartered in Toronto, Canada, has approached the Government of Burundi for cooperation in the mining sector with a special interest in Nickel and Vanadium. In order to apply for the related research permits, the company created in October 2017, a Burundian company called CVMR Energy Metals Burundi SURL to comply with the Burundi Mining Code. The newly created company has applied for research permits for nickel and associated minerals in the Nyabikere and Waga areas for areas of 139.3 km2 and 77.6 km2 respectively, and that of Fer-Titane-Vanadium in the Mukanda area on an area of 144 km2. This company is committed to complying with Burundian legislation, especially the Mining Code and its implementing regulations. In case of positive results of the feasibility studies, the investments in the exploitation will generate revenues and currencies for the Treasury. In view of the proposed work program and the technical and financial capabilities of this company and the positive impact of its activities on the national economy, the technical services that analyzed the file proposed to grant the requested permits. All three drafts were adopted. 8. Draft Decree establishing the National Solidarity Day, presented by the Minister of Interior and Patriotic Training. Since times immemorial, Burundians have always been characterized by the spirit of mutual aid and community solidarity. But since its independence, Burundi has experienced several socio-political crises that pushed many people into poverty. Moreover, in recent times, Burundi has experienced natural disasters due to climate change causing enormous damage and scores of needy populations. To help people in the affected areas, the Government had to launch an appeal for local solidarity, to which the mobilized populations have always responded positively with impressive contributions. The proposed text therefore tends to encourage the rooting of this caring culture through the organization of a Local Solidarity Day for a good coordination of the collection of related contributions. After exchanges, the draft was adopted with a few amendments particularly the recommendation to place this Day the last Saturday of the month of July not to increase the number of bank holidays. However, other charity days can be organized outside this special day. 9. Note on the Reorganization ONATEL, presented by the Minister of Posts, Information Technologies, Communication and Media. ONATEL is currently experiencing enormous technical, commercial and financial difficulties that jeopardize its profitability. This situation is due to certain exogenous factors, notably the arrival of several mobile telephone companies competing with more advanced technologies. But also endogenous factors including those related to management may be responsible for the precarious situation of the company. The note proposes a series of strategies and actions to be implemented in order to allow ONATEL regain its place in the ICT sector. Projects have also been identified for its recovery with obviously the support of the government insofar as ONATEL alone is unable to find funding. Finally, the note indicates internal flanking measures to improve the functioning of ONATEL in terms of both financial management and personnel management. The same note proposes other measures that the Government, sole shareholder should take in terms of granting facilities and support so that the recovery objective can be achieved. The Council accepted the principle of recovery but noted that an external and independent audit was necessary but that the good measures already taken must be maintained, notably that of stopping new recruitments and the non-replacement of departures. A team that will reflect more on this issue and report back to the Government within 1 month has been appointed. 10. Memorandum of Understanding with PROCERV Corporation on the Special Economic Zone, presented by the Services of the Second Vice-presidency of the Republic. A Special Economic Zone is a territorially demarcated geographical area which benefits from specific economic regulations different from those applicable to the rest of the national territory. Its purpose is to attract foreign investment, increase export capacity, promote foreign exchange inflows, contribute to economic growth and create jobs. It is within this framework that the WARUBONDO site located in Gatumba area, in Bujumbura Province has been identified to house the first Special Economic Zone in Burundi, and its legal framework was established in February 2017. In order to achieve this goal, UAE-based PROCERV has been identified to bring its experience in the development of Special Economic Zones as it has done in the United Arab Emirates. Its expertise allows its customers to comply with the requirements of Special Economic Zones in accordance with international standards. The Memorandum of Understanding contains the commitments of both parties namely the Government of Burundi and PROCERV as well as the Roadmap for the program of activities for the period from November 2017 to July 2018. The Memorandum was adopted with some adjustments. 11. Note on the Presidential Jet, presented by the Minister of Finance, Budget and Privatization. The Government of Burundi has acquired a presidential aircraft type Gulfstream GIV series No. 1151, which landed at Bujumbura International Airport on 14 December 2016. Since that time, the aircraft has remained grounded while it must be maintained on a regular basis and in this way, caused a lot of expenses because the maintenance work for this plane is imperatively carried out in a specialized workshop outside the country. The aircraft is now in a very good technical condition to be used or operated to generate funds wherever possible. The purpose of the note was to ask the Council of Ministers to approve this operation which is doubly profitable first to facilitate the coverage of maintenance costs of the aircraft, but also to protect the aircraft against certain negative consequences connected with its grounding. It must indeed be stressed that even grounded ; an aircraft continues to require maintenance costs. It should be noted that the aircraft will remain fully available for any owner’s missions whenever necessary. The Council has approved this proposition. 12. In the chapter on Miscellaneous, the members of the Council exchanged various information of national interest.